The aquarium pond has a very large School of Golden Minnows. It's green and yellow in color, and slowly drifts around the perimeter of the aquarium pond area. Even if you aren't in range of the actual Peixe na Rede buff, fishing from the school guarantees getting one Manjubinha Dourada on every cast, except for the occasional Escama de Peixe Brilhante that summons Mágicus. This summon mob works differently, as well. Whereas other fisherfriends' mobs drop nothing and imbue the water to grant 100% catch rates of multiple rep items, Mágicus simply drops the Manjubinha Dourada himself, without affecting the pond. The amount he drops varies greatly; the range I've seen is 20-50 from a kill. Use water-walking of some kind. The pool is literally in motion, and parts of its path runs along cliffs and walls. To effectively follow it, use: class-based water-walking abilities, an Pescador Telúmino with the Tensão Superficial trait activated, the Canoa dos Pescadores toy, or invest in some Elixir de Andar sobre a Água Draenoriano or Elixir de Andar sobre a Água. Enlarge your fishing bobber. I was having some difficulties from time to time being able to interact with my bobber. Whether the lily pads, particles in the air, or the pool itself obstructed it, using a larger than default bobber helped reduce lost casts. Using the Boia Gigante items make it the largest, but I personally made do with the tall Caixote de Flutuadores: Lata de Minhocas bobber. If you're human, which gives Racial - Humano, AND have any other 10% buff, such as IUPI! from the Darkmoon Fayre you get 90 rep each so need only 467 No. With Racial - Humano, AND have any other 10% buff, e.g. IUPI! you get 90 rep each so need only 467 No. Drag the macro icons to an action bar. The icons for the tool tips will be the default red question mark until you make your first catch. Then the icon will change to the inventory icon with the count. When you turn in Manjubinha Douradas or summon Mágicus using the Escama de Peixe Brilhante, the count will go to zero but the icon will remain. If you're solo fishing when Peixe na Rede is up, it's really useful to know whether you've caught a Escama de Peixe Brilhante because you can only have one in your inventory at a time. As soon as you catch a Manjubinha Dourada, the icon (with count) will replace the default icon. If you turn in Manjubinha Douradas, the icon will remain and the count will go to zero. 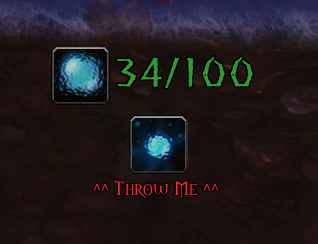 Keep Isca Arcana up to increase your chance of catching bait that attracts rare Suramar fish. Uma misteriosa fenecida que vive nas proximidades das cachoeiras.